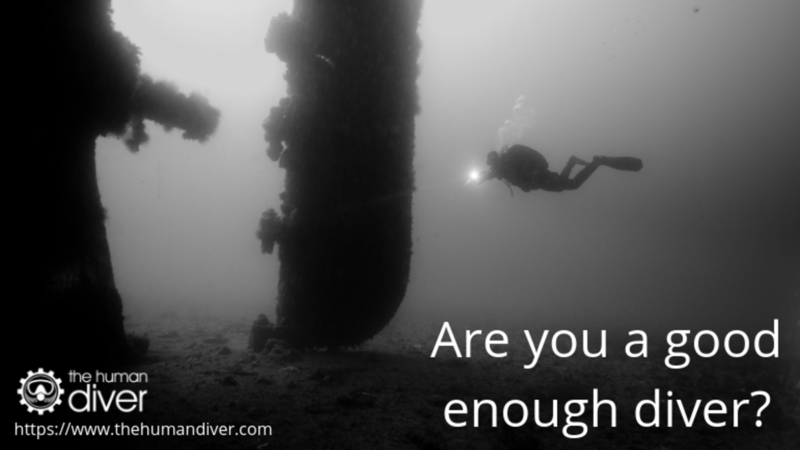 Are you a good enough diver? What does ‘good enough’ mean? If you think about it, ‘Good’ is a relative term because, by definition, there must something or many things which aren’t good and you are making a judgement against your perception of good. The term ‘Doing It Right’ or DIR attracted significant criticism in the 1990s and early 2000s because of a logical fallacy we often use to view the world in binary options. If you aren’t doing it ‘Right’ then you must have been ‘Doing It Wrong’. However, once we grow up from such a childish view, we realise the world is far more complex than that and such binary attributions are not valid nor are they helpful when it comes to learning or improving relationships. There is always a compromise but as long as the compromise is informed and the trade-offs understood, then why not use it? Unfortunately, the same binary attributions are often used for ‘safe’ in diving. Think about what you consider to be ‘safe’? Is an 18m OW dive ‘safe’ compared to a 5-hour cave dive thousands of feet back, or the exploration of a wreck in 60m? Again, there is often a belief that there is a binary view of the world: if you aren’t ‘safe’ and you must be ‘unsafe’. This is obviously false because safety involves avoiding harm and accepting a level of risk. However, the risk is dynamic and the perception and acceptance of that risk is driven by context, experience and the ever moving goals which are being faced. 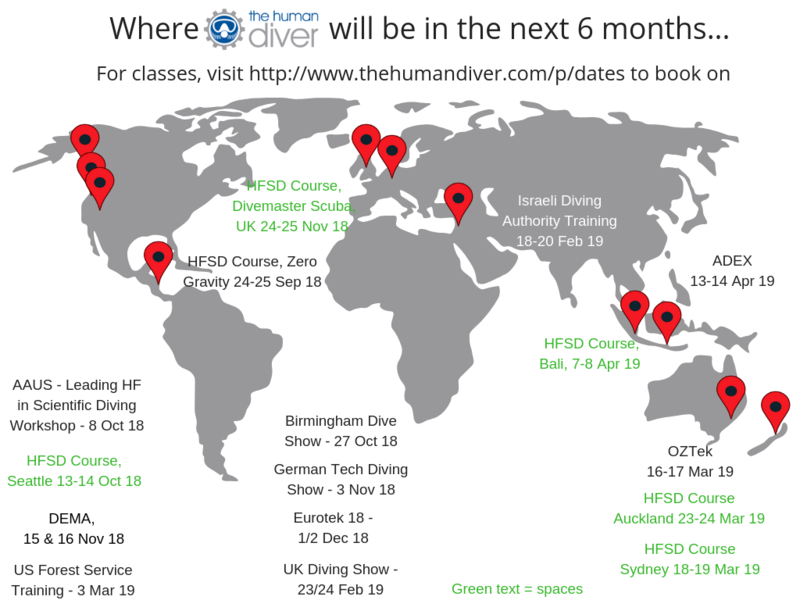 No-one can tell me a quantitive level of acceptable risk or uncertainty in diving, other than zero deaths, but the only to achieve that is not go diving! 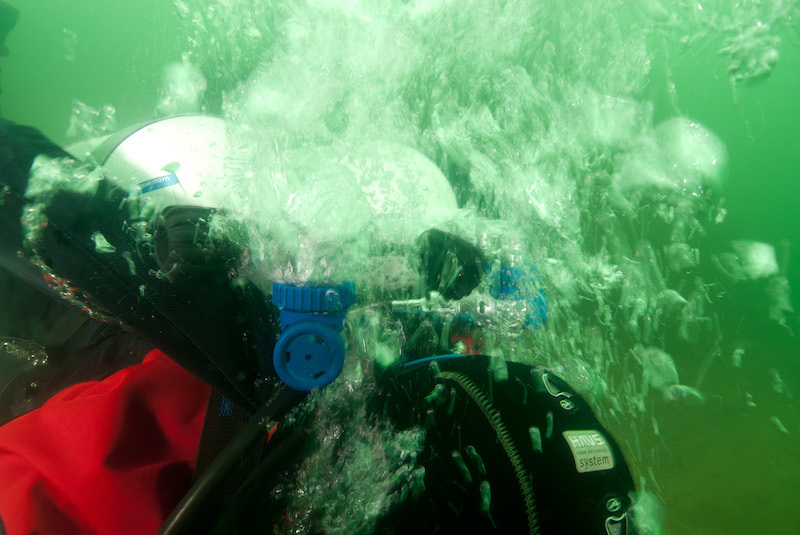 For example, having a free-flowing regulator on a single tank for a new diver could be considered unsafe by them, but for an experienced diver who has undertaken many dives where training to deal with emergency situations is commonplace, then such an event is just a normal activity and wouldn’t be considered unsafe. So we can see that safe and risky are relative terms, often defined or bounded by an outcome rather than the entering behaviours or the situation. This can pose a problem for those who want to improve because society often expects absolutes when it comes to performance i.e. what certification do you hold or what are you qualified to do. However, what has been recognised in high-risk domains is that as soon as you put a defined metric of ‘minimum performance’, it then becomes the norm. This happens for a variety of reasons, not least that humans are simple creatures and we like to expend as little energy as possible, especially mental energy. Therefore if someone has defined a minimum standard, it will become the norm across a large proportion of the community. For those in positions of authority or influence in diving, this focus on minimum standards introduces a dilemma when it comes to commercial viability of an activity. Some training agencies use the ‘sell it cheap, sell lots of it’ to make their money, whereas others work on the quality model, ensuring that both students and instructors focus on high performance and high quality but at an increased cost. This emphasis on quality has a number of advantages, not least an increased retention in the sport because a mindset of learning and developing is instilled and that students/graduates have a ‘want to improve’ not a ‘need to gain another certification card’ and the learning continues after the classes. Compare ‘good enough’ for a diver or instructor candidate who has achieved ‘mastery’ to pass their course, a mastery which is based on the minimum standards, to a diver who recognises that ‘good enough’ means the skills, knowledge and attitude which pertains to a pursuit of excellence. Some of you might think that fast and cheap always means low quality, that isn't the case, another logical fallacy, but it is certainly more likely. the first time with the frame of reference that you need significant time to develop a high fidelity ‘model’. It requires an investment in time and effort to create something worthwhile, something which is ‘good enough’. You will see that in the second half of the video, the image might be ‘good enough’ if you know the context and what the image is supposed to be. A simplified model of reality but one which requires a little effort to understand - it isn’t obvious. the second time with the frame that there is only a finite resource of time to create an image, and that if given a shorter period of time, then the quality of the image will reduce. This is an externally-driven constraint, the operating environment is such that time is a commodity which means a higher level of quality cannot be delivered. In diving, as long as everything goes to the safe plan which was developed, then ‘good enough’ is indeed ‘good enough’. This is the same as the 1 min Spiderman drawing (or the 10sec one), an image which can be interpreted as Spiderman as long as it something we are expecting. However, in real life, things rarely go to plan because we do not have a crystal ball to plan with 100% certainty. Now consider that ‘Spiderman’ is a set of skills or a mental model which helps you solve a problem you encounter when you are diving. Looking at the video above, the two frames of reference concern time (10 mins vs 1 min vs 12 secs) & quality (does it look like Spiderman?). In terms of how good those skills are, it could be argued that time is closely linked with money, both from a delivery perspective (how quickly/cheaply can the course be delivered to a student) and also the time taken to develop the instructor in their training and certification and the associated costs which need to be recovered somehow. A highly skilled instructor will have invested more time and money than a ‘zero to hero’ programme which meets the minimum standards required of the instructor candidate. The instructor can only pass on the skills and knowledge they have attained to their students and so the failure is two-fold, the instructor and student are both ‘good enough’, not just the instructor. In fact, the student will be worse off because there is never 100% accuracy when reproducing something. Crucially, if we want to improve the situation, we need to internally generate a better perspective of ‘Good enough’. 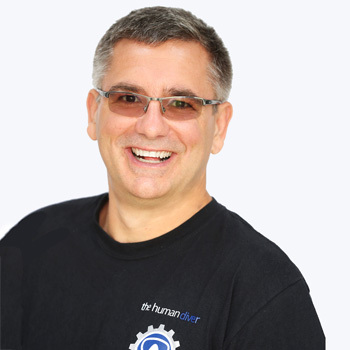 This perspective allows us to trade off between efficiency and thoroughness. When certainty is not clear, we should be more thorough, especially when the consequences could be fatal, but this requires us to slow down and be less efficient. We need to understand what ‘good enough’ is for that diver or group of divers and how they are rationalising the decisions they are making. This weekend I spent some time with someone who dives but also works in the Oil & Gas sector. I mentioned to them during an investigation there is need to know what ‘normal’ work looks like. He responded by saying that the investigations should identify “What they should have done. What ‘good’ looked like.” My response what this isn’t what investigators and those who want to learn from their own and other’s performance should be looking at. ‘Good’ invariably means going back to the standards or best practice, documents which often don’t take into account the constraints on operations like money, time and workload, as such the difference between what is done is sometimes/often very different to ‘normal’. The problem is ‘normal’ is often ‘good enough’ and we need to look at what was different because it is the differences in a system that catch people out. 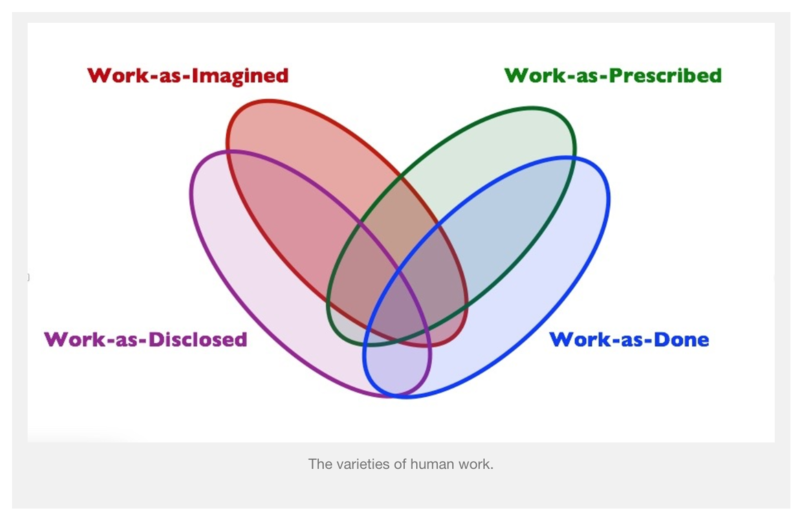 This blog from Steve Shorrock explains the differences between Work as Imagined/Work as Prescribed and Work as Done - just replace ‘work’ with ‘diving’ and you will get a clear view of this conundrum. So what does this look like in diving? A number of years ago I was planning on diving a wreck in approximately 50m off the south coast of the UK with a team of other divers. My gear hadn’t been used for a bit and as I assembled it the day before, I remembered that the suit inflate bottle had been leaking a little from the neck o-ring. I changed the O-ring and charged the bottle. The following day when we loaded the gear on the boat, I made sure that I topped up the suit bottle with a transfer whip. I don’t have a gauge on the 1st stage as I have never needed one (and still don’t!) and the addition of another component adds more failure points. As I get my gear on I connect the drysuit feed, pressing the inflate button and it works. We jump in and start descending down the shotline and at about 30m the suit inflate stops working, the bottle is empty. We get to 50m and I am somewhat uncomfortable because I am now shrink-wrapped. I don’t want to say something to my buddy because we’ve just spent 90 mins getting to the wreck site and I don’t want to thumb the dive as we won’t get back on the site. Fortunately (for me), we hit the seabed and the wreck is nowhere to be seen. We swim around for about 5 mins trying to find it before deciding that enough is enough and we thumb the dive. As we ascend, the pressure reduces and the discomfort stops. Any person can thumb a dive for any reason. A mantra that is drummed into divers. It should be true. However, it doesn’t take into account the social circumstances involved. If you are diving regularly and can afford to throw a dive for money or time purposes, then thumbing a dive for something like this is easy. However, when divers (most divers?) are time poor, rather than money poor, they will accept something which is ‘good enough’ in current situation rather than ‘good enough’ in the cold light of day. We are always subject to an Efficiency-Thoroughness Trade-Off (ETTO). We never have enough money, time, equipment to do what we’d like to do in the manner which we’d like to. This means we are trading one off against another based on an acceptable level of uncertainty. However, it is not possible to define this level in a quantitive manner so we use biases (recency bias and recall bias) to help us make those decisions. In many cases, a sub-optimal ‘good enough’ is indeed good enough because the gremlins in the system, the latent pathogens which Professor James Reason describes, haven’t merged to create that perfect storm. So the next time you are dealing with some uncertainty and you have a ‘choice’ about what is ‘good enough’ (mediocrity or excellence), consider which Spider-Man (mental model/skill set) you’d like to be looking at to help you solve the problem you’ve just encountered. Remember, if your ‘choice’ is wrong, you will only find out as the event unfolds in front of you and it might be too late to resolve without serious injury or death. To improve our determination of ‘good enough’ we can share context-rich stories of near misses and incidents. These stories should explain the local rationality of why the storyteller thought the situation was ‘good enough’ and what caused things to tip the balance the wrong way in this particular occasion. The analysis should not be judged based on outcomes, be that a good outcome or a bad outcome because if the outcome was bad, the tendency to judge more harshly due to outcome bias is normal. In addition, you have more information than the diver in the situation, you know with 100% certainty what will happen.